Heregulins (HRGs) are a group of polypeptide factors that are encoded by four different HRG genes that can express multiple isoforms through alternate RNA splicing. A number of HRG isoforms possess both growth stimulatory and growth inhibitory functions that are necessary for their important role in the development and maintenance of the heart, nervous system and epithelial cells in multiple organs including the breast. Growth inhibition by HRG relates to its ability to induce apoptosis, differentiation, and cell cycle G2 arrest. 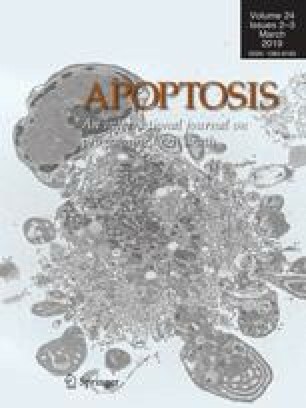 Current studies suggest that HRGs can induce a unique form of apoptosis. In this article, we review recent progress in characterizing and understanding HRG-induced apoptosis. Particular attention has been given to: (1) the activation of caspases-7 and -9; (2) the role of the anti-apoptotic Bcl-2 protein; and (3) the signaling molecules and pathways that regulate HRG-induced apoptosis, including the p38, JNK, mTOR kinase, and PKCα kinase.